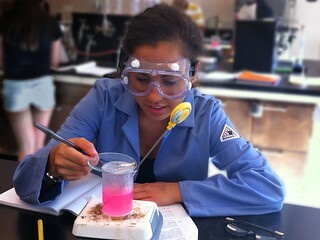 Emory University freshman Alexa Dantzler maintains the temperature of a solution that, after reacting it with several chemicals, will allow her to determine how much calcium carbonate exists in an antacid tablet. As we work our way through the year 2015 (which is nearly three-fourths over! ), STEM efforts are a focus in almost all classrooms across the U.S. and around the world. STEM included Science and Mathematics as major parts of the curriculum, and it also includes Technology and Engineering. The classrooms of today, as well as in the future, must include Technology and Engineering as equal facets of the new curriculum. STEM is expected to make changes involving teaching and hopefully encourage more students to pursue STEM careers. It will also provide students the experience of actually “doing” science. STEM students need to be creative thinkers, as well as critical thinkers. Students need to make decisions based on information, not just guessing what needs to be done when trying to solve problems. Both teachers and students will make mistakes as they try to solve problems. But from these mistakes learning can be achieved! STEM is a process of students working together as team players. Team efforts help build tolerance, respect for others, and valuing what others think. These STEM efforts will help students move from “individual thinkers” to “group thinkers” when working on problems which are personal, local, societal, and in some instances, even global problems. A major goal facing science teachers today is making sure that students are ready for college and hopefully more interested in pursuing STEM careers after graduation from high school. But, we do not want students merely reading textbooks and following directions included in laboratory manuals. STEM teaching requires more than merely using typical teacher-directed lesson plans, textbooks, and lectures. Changes in science teaching will be slow because of expectations voiced by teachers, school administrators, parents, and likening typical teaching to mimic college teaching. How soon can we expect success with the needed changes? Will STEM efforts encourage today’s students to pursue STEM careers? Will future students be influenced by STEM efforts regarding their career goals? Can classroom efforts succeed with real learning that will be useful in dealing with everyday problems? Are these changes really helpful for students enrolled in college? Image courtesy of Isabelle Saldana, Intel Free Press. This entry was posted in The Leading Edge and tagged STEM. Bookmark the permalink. Trackbacks are closed, but you can post a comment.